Almost a year ago to the day, I wrote about the impact DJI's Phantom 2 Vision+ might have on our skies. Up to that point, drones (or quadcoptors/multirotors, for the purists) had been slowly edging their way into mainstream consciousness. DJI's ready-to-fly Vision series, with their built-in cameras and easy operation turbocharged that creep into a march. The Phantom 3 Professional is what would have been the new Vision (it's dropped that branding), and is the first in this consumer lineage to shoot 4K video. What's changed in the last 12 months? In some regards, not much. Governments are still figuring out how to legislate quadcopters, while people keep buying them. As for DJI, it's got a lot more competition, and higher expectations for what a drone should do. I was eager to spend time with the Phantom 3, and get a feel for how the company has evolved, and more importantly, where it's going — and it looks like taking over our skies is only one part of its plan. 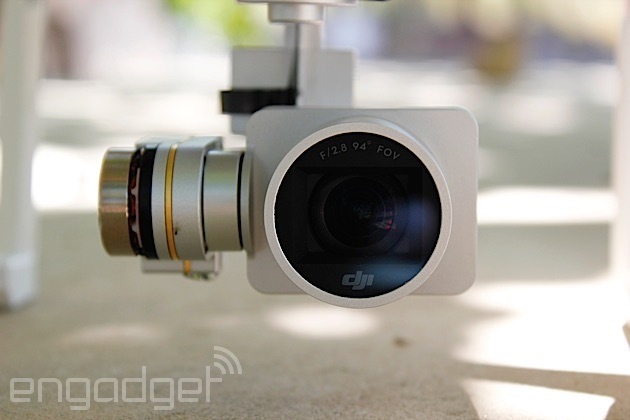 DJI has cornered the consumer drone market by making its products accessible and easy to use. Despite the "Professional" name, the Phantom 3 is a 4K video drone that's perfect for the masses. Hobbyist video makers and amateur fliers have an easy choice in the Phantom 3, but we'd love to see it get a facelift and some smarter features. 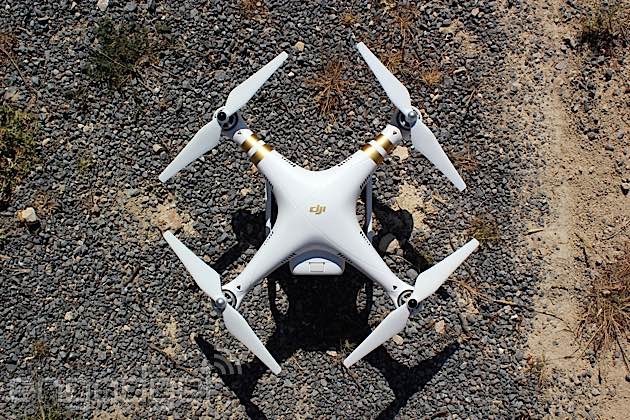 Be the first to review the Phantom 3? 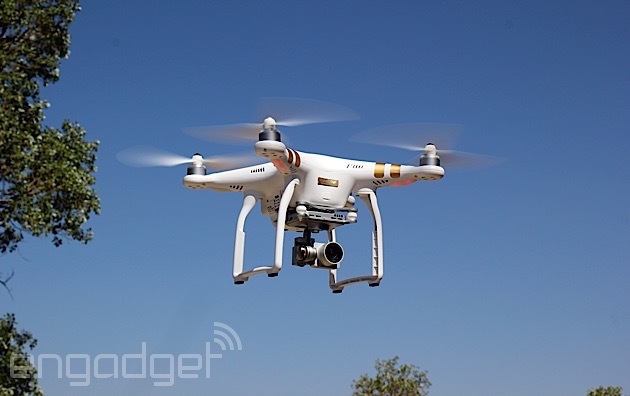 DJI launched the Phantom 3 in two varieties: Professional ($1,259) and Advanced ($999). The main difference between them is that the former shoots 4K; the latter, "only" 1080p/Full HD. The craft themselves are otherwise the same. DJI clearly thinks it's onto a winner with the Phantom's design, as the Phantom 3 is nearly identical to the Phantom 1. There are some differences, but by and large it's the same bulbous, white quadcopter it's always been. It's inoffensive, but I do wish it'd inherited some of the Inspire 1's design language, or something other than gold/silver stickers to make it stand out. Less visible improvements have been added to make the Phantom 3 fly better. These include a new motor tilt for better stability, smart braking and a whole new flight controller (the brains). On the outside, there's wider landing gear -- which helps keep it out of view from the camera -- and an extra compartment to house a new downward sensor for indoor flying. The new landing gear isn't so wide that it prevents it from fitting in the case I have for the Phantom 2, which is good. The battery is different, too. It looks near identical, but if you thought you could use your existing spares from the Phantom 1/2 on the 3, no dice. This is a huge bummer, as many of the long-time Phantom owners will have spares (you can only fly 15 to 20 minutes per charge). 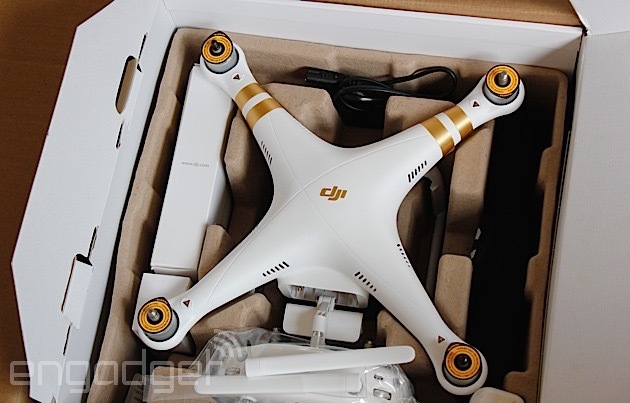 Any upgraders will have to re-buy extras, and at $149 for the Phantom 3, they ain't cheap. The controller, on the other hand, is all change. It's smaller, has more buttons and features an internal battery (no more lugging spare AAs around like before) with an LED power level indicator and a USB connection for your phone. This last addition is important, as it ties into a hidden piece of hardware inside the controller, which enables one of the Phantom 3's best features: live HD streaming from the camera to your handset. The Phantom 2 Vision+ did something similar, but relied on a WiFi connection between your phone and the controller, which then relayed images back from the drone. It worked, but was one more thing to charge, and then set up pre-flight -- and the connection was often flaky. The Phantom 3 swaps WiFi for DJI's own Lightbridge technology (a $1,399 accessory on its own), baked right into the 'copter and the controller. All you have to do is connect your phone or tablet (iOS and Android) to the USB port, and you're good to go. 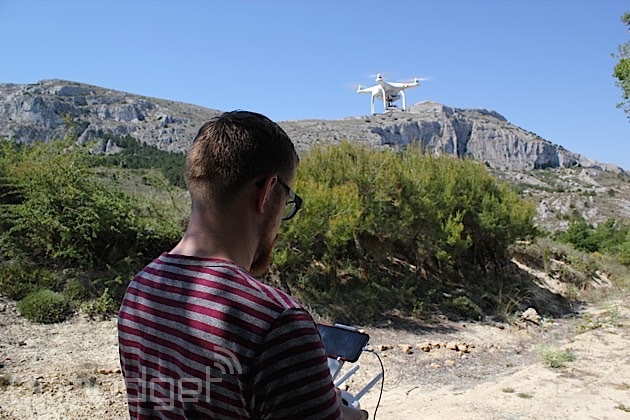 The Phantom 3 streams video direct to your device in 720p from a distance of up to 1.2 miles. An added bonus is that your phone will charge while connected to the controller. A small detail, but the Phantom 2 Vision+ required you had enough power on three things (the controller, the WiFi extender and the mobile device) before you even switched on the quadcopter. The whole experience is much simpler now. A huge improvement with the new controller is the slew of buttons and camera controls DJI added. Now, you can change the camera angle, start/stop recording, take photos and more (two buttons are customizable) without using the app; this is much easier to do without looking (i.e., while you're keeping your eyes on the quad). The more comprehensive controls also mean you don't have to connect a phone or tablet at all if you don't want to -- you'll still have access to everything you need. I'd recommend you do use the app, though; it really elevates the experience. So how about that app? Anyone who's flown DJI's prosumer Inspire 1 quadcopter will already be familiar with it because it's the same one. DJI Pilot has four sections: camera, director, store and user center. From the camera section you can access everything you need to know to fly the Phantom 3. With your phone connected to the controller, and your Phantom switched on, you'll instantly get a live feed from the camera. On top of this feed, around the edge of the display are an almost overwhelming number of dials, numbers and other widgets. Once you've figured out what everything means, it's not daunting, but you might want to take a few minutes to get your head round them all if you're new to flying. For the most part, these controls tell you things like your altitude, how far away the Phantom is, where it is on a map (in GPS mode) and so on. On the left are buttons for auto takeoff or landing/return to home. On the right, you'll find a big red shutter button to start recording/take photos and a shortcut to the camera settings. 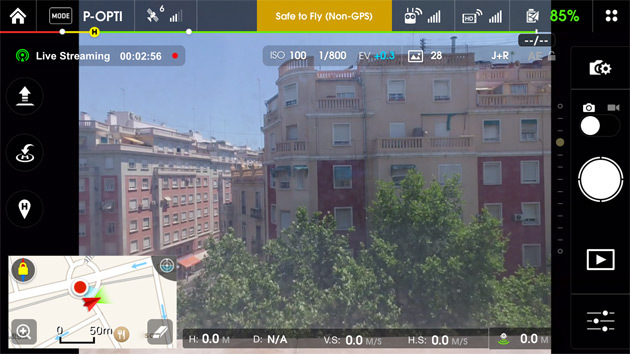 Along the top, you'll see how strong your connection is, how many GPS satellites the drone sees (and thus whether the drone is safe to fly), plus access to more general settings. I prefer to handle takeoff and landing from the controller, and use the app just to see what the camera sees. Then again, it is useful to see how much battery life/flight time you have left too. 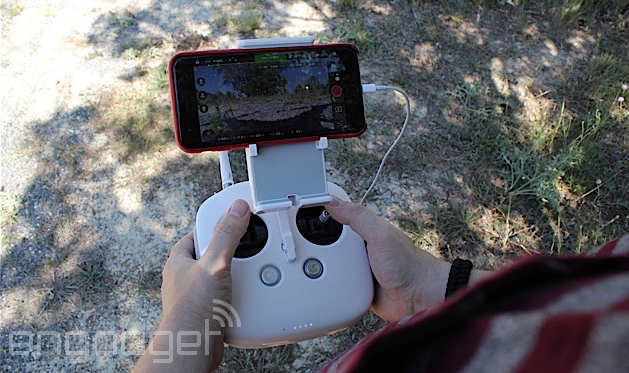 The first-person view (FPV) from the camera is a big upgrade from the Phantom 2 Vision+. The quality of the feed is much better, and the connection is pretty solid. This makes the flying experience way cooler, as you can reliably use it to see exactly where the quad is (depth perception is trickier than you think). The real win, though, is how much it improves your photography. I've had so many shots ruined because the framing was even just a little off, or the tilt of the camera was wrong. The Phantom 3 removes all those problems, giving you a dependable, clear view of your shot. 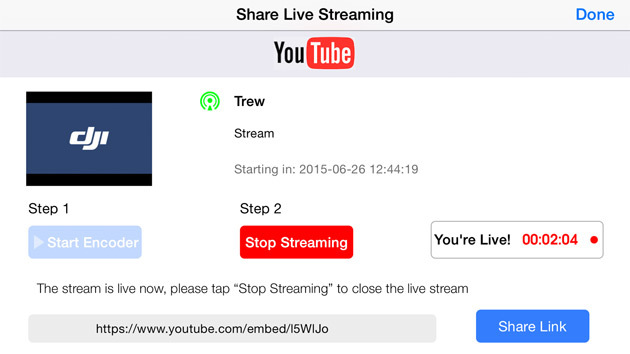 One other feature of the app: streaming your drone's camera footage straight to YouTube. This works fairly well (I had some artifacts, but generally ok), but there's one big prerequisite: that you're flying somewhere with decent cell signal. Your stream will be in 720p (though viewers may need to choose this), and audio is taken from your phone's mic for commentary. However, I did most of my test flights in the hills, away from the crowds and hustle of the city. And, it turns out, the reaches of my mobile operator. Livestreaming is perhaps a bit of a novelty for most fliers, but it does make the Phantom 3 useful in a few niche situations. The idea that you could livestream video from the sky has obvious uses in journalism/reporting or other "live event" situations. Assuming you keep your Phantom nearby and ready to fly, that is. Either way, it's a nice addition to the Phantom feature set. After a couple of flights, something interesting becomes apparent. Most people know DJI as a drone company, but it's also in the camera game (via stabilizers and other rigs, as well as flying cameras). On the Vision series, the shooters were okay, but utilitarian, forgettable. The Inspire 1 was when DJI started upping its game, and this trend carries over to the Phantom 3 with its 4K/12-megapixel offering (for those interested, the sensor is a 1/2.3" Sony Exmor). The more I flew, it started to become obvious that, if anything, the drone is almost secondary. Flying is fairly easy, and fun in and of itself, but getting a great photo or video is so much more rewarding. It really helps that, in the Phantom 3's camera, DJI has eliminated nearly every pain point that plagued the Vision series. I already mentioned the landing gear has been widened to prevent it from getting in shot. To further help with this, the camera now has a narrower field of view -- 94 degrees, down from 140 (with a 35mm-equivalent focal length of 20mm and infinite focus). One bugbear remains, though, which is that it's still easy to get the propellers in shot when flying forward at speed -- but that's a harder problem to solve. The Phantom 3's FOV also helps with something else: fisheye distortion. The Phantom 3 barely has any. For the technical fans, DJI tells me this is because "it is a 9-element rectilinear lens which is designed specifically for aerial and long distance shooting." This is also why the close up focus isn't so good (see samples in the gallery), it was designed for aerial, and not general purpose. The color balance also seems much improved from the Vision+, and the gimbal it hangs from keeps it steady as a rock. When you factor in a bunch of new shooting modes (burst, time-lapse, etc.) and manual exposure settings (via that app), you've got a really comprehensive photography tool. Talk is one thing; the video should speak for itself. And it does. Watching back the 4K video clips on a 55-inch UHD TV is a delight. I had my technophobe, hard-to-impress parents-in-law slack jawed as I showed them their own (metaphorical) backyard as seen from the sky, and in pin-sharp resolution. Below is a short edit of some footage obtained over a weekend. The player won't show it in 4K, but I've uploaded one of the unedited clips here so you can download it directly and see for yourself. The question many people might have right now is whether to get the Phantom 3, and the proprietary camera. Or, go for a Phantom 2, and use a GoPro instead. That's a good question, as by far and away, right now, most people fly with a GoPro. I really expected to prefer the GoPro over DJI's own camera, but actually I'm torn. With the GoPro, you have many more video settings, so if you need something exotic like 960p at 120fps, then you need a GoPro, you can, of course, also use that GoPro for other things, too. If, however, you want 16:9 cinematic shots in high resolution it's a tough call. When you factor in the other benefits of using the DJI camera (first-person view, native controls, no-fuss setup), the case for a GoPro doesn't seem so strong. For most users, it'll come down to whether you want a more versatile camera, or, the extra features, and ease of use that DJI's provides. Below are two clips for comparison. One is shot on the Phantom 3 (top), the other on a GoPro (bottom), both originally at 4K. I've been flying Phantoms for a while now, but it's still exciting every time. Nothing changes with the Phantom 3. That includes the annoying four "bleeps" when you switch it on, which lets everyone know you're about to creep on them from the sky. The first time I try it is inside my apartment. This thing has sensors to help it keep position; I have to test them. I'm nervous taking off, and my cat doesn't like it at all, but to my surprise it works well. I manage a lap of my modest front room without incident (typically a regular drone would have drifted into a wall in seconds). It also does an incredible job at stirring up all the dust/loose papers in your house! I don't really want to fly indoors, though, so I spend the rest of the time outside, in the hills and coastline. Ya know, things worth seeing. I'm used to taking off manually, but I try the auto-takeoff out of curiosity. It works well, but I don't really feel much benefit. By the time I've pressed and held the button on the app, I could have taken off the usual way with the sticks. Once up in the air, the first thing that strikes me is the app, and the quality of the live feed. So much better than before, especially on a large display like an iPad Mini. I'd tried the app on several Android phones first, but I couldn't get any to work very well. DJI told me you need to close all other apps, but that didn't make much difference for me. The live video feed is good enough that you can get much closer to landmarks or objects in the distance than would be possible using eyesight alone. That's not recommended, though, as you could easily miss some power cables, or other hard-to-see object. The real joy of the video stream is just knowing I got the shot. One time, I was flying over a lake in a small canyon. On top of one side is an old, disused building. I flew, or thought I flew, to a position with it in the center of the camera. When I checked the video stream, though, I was quite a way off. I also found it improved my general depth perception (and, in turn, my flying). Later on that same day, I took the Phantom 3 up into the hills. There was an interesting rock formation that I was able to fly to directly because I had a better perception of where the drone was thanks to practice with the video stream. DJI gave the Phantom 3 a new flight controller, tweaked the moto tilt and added smart speed control. These improve the performance compared to previous Phantoms considerably. The whole flight experience feels tighter, more responsive, and this all feeds into better stability and battery life. A much improved beast. Another benefit of an all-in-one setup like the Phantom 3 is that everything is designed to work together. The camera, the gimbal, the radio link for the video stream, et cetera. The result of which is longer battery life and flight time. With the Phantom 2, a gimbal, GoPro (taking its power from the drone) and a video downlink, vital minutes are shaved off your air time. Under the same conditions with the Phantom 3, I was getting 20 mins in the air, whereas the Phantom 2 was nagging me to (urgently) land it after 15. When the Phantom 3 wants you to land, you can probably keep it up for a few minutes more; it just plays things safe. Drones, it seems, are big business. If you browse the dedicated RC web stores, you'll find more brands and models than you'd know what to do with. For a newcomer, it can be quite daunting. Then, of course, you could build your own. It's analogous to buying, or building a PC. You'll almost always get more for your money if you do it yourself. But, shock, some people don't want that hassle, and just want to open a box and go. It's for those people that the DJI Phantom 3 exists. But it's not the only one. Perhaps the most obvious rival for your attention is 3DR's Solo. It was announced just days after the Phantom, and offers a lot more in terms of flight features (a follow-you option, exotic camera angle modes and so on). But, it also costs $140 more (with a gimbal) and you need to have your own GoPro (another $400-plus). This makes it a chunk of change more expensive, even more so if you don't want/need 4K, and can get by with the Phantom 3 Advanced. But, for those that already own a GoPro, the decision could be a lot harder, we're reserving judgement until we've tested the Solo ourselves. If you really want something simple that'll do basic video, something like Parrot's BeBop is even cheaper still. 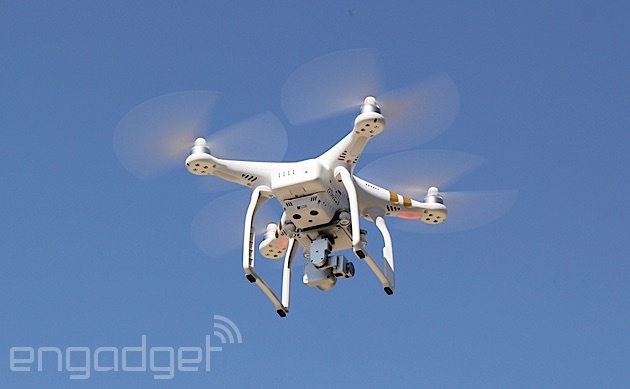 But, it lacks the range, power, quality and control the Phantom 3 offers. If action sports are more your thing, then it may be worth waiting for AirDog, which is scheduled to launch in August, with a host of features specific to all-weather activities. I was a little underwhelmed when the Phantom 3 launched. I was hoping for a more radical redesign, and a few killer autopilot features (DJI say's these are in the works, just they're insistent on them being safe). Instead, DJI played it a little safe, opting instead for practical, functional improvement all round. Now that I've flown one, I get it. The Phantom 3 is a refinement. A huge one. That said, its proprietary design makes it hard to upgrade; it doesn't have some of the more intelligent features its rivals do; and the software is designed for simplicity over anything else. It's also pricier than alternative products of similar specification. But in exchange, it's accessible, reliable and excells at its core tasks of flying and video. Oh, and it's a heck of a lot of fun. It's the quality of the camera and the controls that makes the Phantom 3 worth buying. If you want a hassle-free quadcopter that will shoot high-quality video, it's very easy to recommend this craft. You may not be able to (easily) program its flight path, or win a drag race through the woods, but you'll have a drone that grabs great video, and is a joy to use every single time.